The evergreen fir tree has traditionally been used to celebrate winter festivals (pagan and Christian) for thousands of years. Pagans used branches of it to decorate their homes during the winter solstice, as it made them think of the spring to come. The Romans used Fir Trees to decorate their temples at the festival of Saturnalia. Christians use it as a sign of everlasting life with God. Nobody is really sure when Fir trees were first used as Christmas trees. It probably began about 1000 years ago in Northern Europe. Many early Christmas Trees seem to have been hung upside down from the ceiling using chains (hung from chandeliers/lighting hooks). Other early Christmas Trees, across many parts of northern Europe, were cherry or hawthorn plants (or a branch of the plant) that were put into pots and brought inside so they would hopefully flower at Christmas time. If you couldn't afford a real plant, people made pyramids of woods and they were decorated to look like a tree with paper, apples and candles. Sometimes they were carried around from house to house, rather than being displayed in a home. It's possible that the wooden pyramid trees were meant to be like Paradise Trees. These were used in medieval German Mystery or Miracle Plays that were acted out in front of Churches on Christmas Eve. In early church calendars of saints, 24th December was Adam and Eve's day. The Paradise Tree represented the Garden of Eden. It was often paraded around the town before the play started, as a way of advertising the play. The plays told Bible stories to people who could not read. The first documented use of a tree at Christmas and New Year celebrations is argued between the cities of Tallinn in Estonia and Riga in Latvia! Both claim that they had the first trees; Tallinn in 1441 and Riga in 1510. Both trees were put up by the 'Brotherhood of Blackheads' which was an association of local unmarried merchants, ship owners, and foreigners in Livonia (what is now Estonia and Latvia). Little is known about either tree apart from that they were put in the town square, were danced around by the Brotherhood of Blackheads and were then set on fire. This is like the custom of the Yule Log. The word used for the 'tree' could also mean a mast or pole, tree might have been like a 'Paradise Tree' or a tree-shaped wooden candelabra rather than a 'real' tree. A picture from Germany in 1521 which shows a tree being paraded through the streets with a man riding a horse behind it. The man is dressed a bishop, possibly representing St. Nicholas. In 1584, the historian Balthasar Russow wrote about a tradition, in Riga, of a decorated fir tree in the market square where the young men “went with a flock of maidens and women, first sang and danced there and then set the tree aflame”. There's a record of a small tree in Breman, Germany from 1570. It is described as a tree decorated with "apples, nuts, dates, pretzels and paper flowers". It was displayed in a 'guild-house' (the meeting place for a society of business men in the city). The first person to bring a Christmas Tree into a house, in the way we know it today, may have been the 16th century German preacher Martin Luther. A story is told that, one night before Christmas, he was walking through the forest and looked up to see the stars shining through the tree branches. It was so beautiful, that he went home and told his children that it reminded him of Jesus, who left the stars of heaven to come to earth at Christmas. Some people say this is the same tree as the 'Riga' tree, but it isn't! The Riga tree originally took place a few decades earlier. The custom of having Christmas trees could well have travelled along the Baltic sea, from Latvia to Germany. In the 1400s and 1500s, the countries which are now Germany and Latvia were them part of two larger empires which were neighbors. Another story says that St. Boniface of Crediton (a village in Devon, UK) left England and traveled to Germany to preach to the pagan German tribes and convert them to Christianity. He is said to have come across a group of pagans about to sacrifice a young boy while worshipping an oak tree. In anger, and to stop the sacrifice, St. Boniface is said to have cut down the oak tree and, to his amazement, a young fir tree sprang up from the roots of the oak tree. St. Boniface took this as a sign of the Christian faith and his followers decorated the tree with candles so that St. Boniface could preach to the pagans at night. Once on a cold Christmas Eve night, a forester and his family were in their cottage gathered round the fire to keep warm. Suddenly there was a knock on the door. When the forester opened the door, he found a poor little boy standing on the door step, lost and alone. The forester welcomed him into his house and the family fed and washed him and put him to bed in the youngest sons own bed (he had to share with his brother that night!). The next morning, Christmas Morning, the family were woken up by a choir of angels, and the poor little boy had turned into Jesus, the Christ Child. The Christ Child went into the front garden of the cottage and broke a branch off a Fir tree and gave it to the family as a present to say thank you for looking after him. So ever since them, people have remembered that night by bringing a Christmas Tree into their homes! In Germany, the first Christmas Trees were decorated with edible things, such as gingerbread and gold covered apples. Then glass makers made special small ornaments similar to some of the decorations used today. In 1605 an unknown German wrote: "At Christmas they set up fir trees in the parlours of Strasbourg and hang thereon roses cut out of many-colored paper, apples, wafers, gold foil, sweets, etc." The first Christmas Trees came to Britain sometime in the 1830s. They became very popular in 1841, when Prince Albert (Queen Victoria's German husband) had a Christmas Tree set up in Windsor Castle. In 1848, drawing of "The Queen's Christmas tree at Windsor Castle" was published in the Illustrated London News. The drawing was republished in Godey's Lady's Book, Philadelphia in December 1850 (but they removed the Queen's crown and Prince Albert's moustache to make it look 'American'!). Tinsel was also created in Germany, were it was originally made from thin strips of beaten silver. But when plastic/man made tinsel was invented, it became very popular as it was much cheaper than real silver and also lighter to go on the tree! There are also folk stories about how tinsel was created - by The Christmas Spider! These tales seem to have started in Eastern Germany, Poland or Ukraine but are also told in parts of Finland and Scandinavia. The stories are now also popular in other countries such as the USA; although I live in the UK and most people in my country have never heard of the story/legend! All the versions of the story involve a poor family who can't afford to decorate a Tree for Christmas (in some versions the tree grew from a pine cone in their house, in others the family have bought a tree into the house). When the children go to sleep on Christmas Eve a spider covers the tree in cobwebs. Then on Christmas morning the cobwebs are magically turned into silver and gold strands which decorate the tree! Some versions of the story say that it's the light of the sun which changed the cobwebs into silver and gold but other versions say it's St Nicholas / Santa Claus / Father Christmas / das Christkind which made the magic happen. In parts of Germany, Poland, and Ukraine it's meant to be good luck to find a spider or a spider's web on your Christmas Tree. 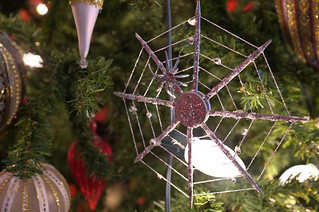 Spider's web Christmas Tree decorations are also popular in Ukraine. They're called 'pavuchky' (which means 'little spider') and the decorations are normally made of paper and silver wire. You might even put an artificial spider's web on your tree! There are a few different claims as to who invented popularised the first strings of 'electric' Christmas Tree lights. In 1880, the famous inventor Thomas Edison put some of his new electric light bulbs around his office. And in 1882 Edward Johnson, who was a colleague of Edison, hand-strung 80 red, white and blue bulbs together and put them on his tree in his New York apartment (there were two additional strings of 28 lights mounted from the ceiling!). In 1890 the Edison company published a brochure offering lighting services for Christmas. In 1900 another Edison advert offered bulbs which you could rent, along with their lighting system, for use over Christmas! There are records in a diary from 1891 where settlers in Montana used electric lights on a tree. However, most people couldn't easily use electric tree lights at this time as electricity wasn't widely installed in homes. But rich people liked to show off with lights installed just for Christmas, this would have cost about $300 per tree then, more than $2000 money today! Electric tree lights first because widely known in the USA in 1895 when President Grover Cleveland has the tree in the White House decorated with lights as his young daughters liked them! The tradition of the National Christmas Tree on the White House lawn started in 1923 with President Calvin Coolidge. The first commercially available electric string of lights, which more people could afford, were advertised in 1903 when a string of 24 lights cost $12 or you could rent lights from $1.50. This was still quite expensive, but much cheaper than $300. Another claim to the first widespread sale of strings of lights comes from Ralph Morris, an American telephonist. In 1908, he used telephone wire to string together small bulbs from a telephone exchange and decorated a table top tree with them. Leavitt Morris, the son of Ralph, wrote an article in 1952 for the Christian Science Monitor, about his father inventing Christmas Tree lights, as he was un-aware of the Edison lights. In 1885 a hospital in Chicago burned down because of candles on a Christmas Tree. In 1908 insurance companies in the USA tried to get a law made that would ban candles from being used on Christmas Trees because of the many fires they had caused. However, people still used candles to light Christmas Trees and there were more fires. The most lights lit at the same time on a Christmas tree is 194,672 and was done by Kiwanis Malmedy / Haute Fagnes Belgium in Malmedy, Belgium, on 10 December 2010! Many towns and villages have their own Christmas Trees. One of the most famous is the tree in Trafalgar Square in London, England, which is given to the UK by Norway every year as a 'thank you' present for the help the UK gave Norway in World War II. The White House in the USA has had a big tree on the front lawn since the 1920s. The record for the most Christmas trees chopped down in two minutes is 27 and belongs to Erin Lavoie from the USA. She set the record on 19th December 2008 on the set of Guinness World Records: Die GroBten Weltrekorde in Germany. Artificial Christmas Trees really started becoming popular in the early 20th century. In the Edwardian period Christmas Trees made from colored ostrich feathers were popular at 'fashionable' parties. Around 1900 there was even a short fashion for white trees - so if you thought colored trees are a new invention they're not! Over the years artificial trees have been made from feathers, papier mâché, metal, glass, and many different types of plastic. The tallest artificial Christmas tree was 52m (170.6ft) high and was covered in green PVC leaves!. It was called the 'Peace Tree' and was designed by Grupo Sonae Distribuição Brasil and was displayed in Moinhos de Vento Park, Porto Alegre, Brazil from 1st December 2001 until 6th January 2002. In many countries, different trees are used as Christmas trees. In New Zealand a tree called the 'Pohutakawa' that has red flowers is sometimes used and in India, Banana or Mango trees are sometimes decorated. You can decorate an online Christmas Tree in the fun section of the site!